Sajeev John is a ''University Professor'' at the University of Toronto and Government of Canada Research Chair holder. He received his Bachelor's degree in physics in 1979 from the Massachusetts Institute of Technology and his Ph.D. in physics at Harvard University in 1984. His Ph.D. work at Harvard introduced the theory of classical wave localization and in particular the localization of light in three-dimensional strongly scattering dielectrics. From 1986-1989 he was an assistant professor of physics at Princeton University. 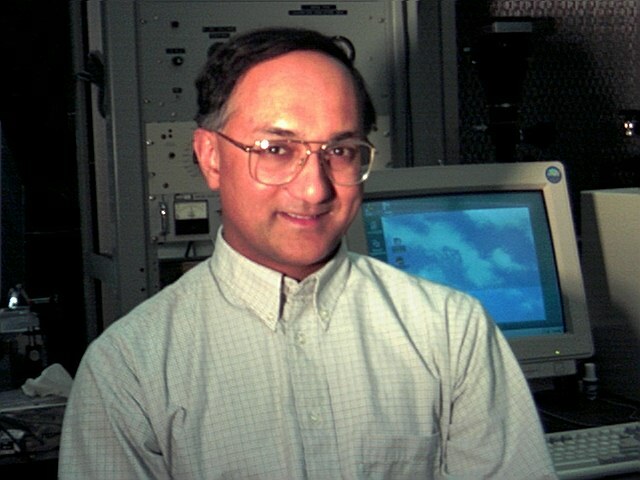 While at Princeton, he co-invented (1987) the concept of photonic band gap materials, providing an easier route to his original conception (1984) of the localization of light. In the fall of 1989 he joined the senior physics faculty at the University of Toronto. Professor John is the winner of the 2001 King Faisal International Prize in Science, which he shared with C. N. Yang. He is also the first ever winner of Ontario's Platinum Medal for Science and Medicine in 2002. Dr. John is the winner of the Institute of Electrical and Electronics Engineers (IEEE) International Quantum Electronics Award in 2007 for ''the invention and development of light-trapping crystals and elucidation of their properties and applications''. He is also the winner of the 2008 IEEE Nanotechnology Pioneer Award and the 2013 IEEE David Sarnoff Award. Prof. John was awarded the Killam Prize in Natural Sciences for 2014 by the Canada Council for the Arts. Most recently, he was appointed as an Officer of the Order of Canada "For his revolutionary contributions to optical sciences, notably for his role in the development of new structures capable of harnessing the flow of light." Dr. John is also the first ever winner of Brockhouse Canada Prize in 2004, which he shared with materials chemist Geoff Ozin for their ground-breaking interdisciplinary work on photonic band gap materials synthesis. In 2011, Prof. John was selected as a Thomson-Reuters Citation Laureate. Prof. John has been awarded the Guggenheim Fellowship (USA) and the Humboldt Senior Scientist Award (Germany). In 2007, Dr. John was awarded the C.V. Raman Chair Professorship of the Indian Academy of Sciences. Prof. John is a Fellow of the American Physical Society, the Optical Society of America, the Royal Society of Canada, and a member of the Max-Planck Society of Germany. Prof. John's other awards include the 2007 Brockhouse Medal for Condensed Matter Physics and Materials Physics, the 2004 Rutherford Medal of the Royal Society of Canada, the Killam Research Fellowship of the Canada Council for the Arts (1998-2000), the 1997 Steacie Prize of the National Research Council, the first ever McLean Fellowship at the University of Toronto and the Herzberg Medal of the Canadian Association of Physicists. His external affiliations have included Adjunct Chair Professor at Soochow University in Suzhou China, Adjunct Professor at King Abdulaziz University, Saudi Arabia, Guest Professor at Sun Yat Sen University in China, External Scientific Member of the Max Planck Institute for Microstructure Physics in Germany, Meyerhoff Visiting Professor at the Wiezmann Institute in Israel and Fellow of the Canadian Institute for Advanced Research. Electromagnetism is the fundamental mediator of interactions in condensed matter and atomic physics. It is extraordinary that such a basic interaction can be tailored within an artificial material, leading to a variety of new physical phenomena. This began with the study of classical wave localization in disordered media, eventually focusing on electromagnetic waves. It was then theoretically predicted and later experimentally demonstrated that in a new class of dielectrics (see movie clip) light can exhibit strong localization. These dielectric materials are the photonic analogs of semi-conductors and have important technological applications. We are studying the implications of light-trapping in both classical and quantum-electrodynamics. This has applications for optical communications, information technology, lighting, solar energy harvesting, and medical diagnostics to name a few. We have demonstrated the efficacy of thin-film photonic crystals for solar light trapping and electrical power generation. 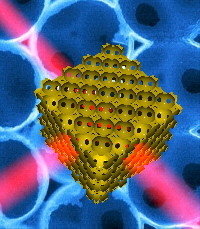 These photonic crystals consist of various (conical or inverted-pyramid) nano-pore arrays. These structures absorb more sunlight than a longstanding benchmark known as the Lambertian limit [Solar light trapping in slanted conical pore photonic crystals: beyond statistical ray trapping J. of Applied Physics 113, 154315 (2013)]. The novel underlying physics of these solar cell architectures comes from an effect known as Parallel-to-Interface Refraction and subsequent light-trapping in slow group velocity modes. Rather than making use of a photonic band gap, these solar cells rely on the ability of photonic crystals to greatly increase the electromagnetic density of states over selected frequency regimes. With only one micron (equivalent bulk thickness) of silicon it is possible to absorb nearly 85% of all available sunlight in the wavelength range of 300-1100 nm. This enables a one-micron thick silicon photonic crystal to achieve a power conversion efficiency of 17.5%, surpassing commercial silicon solar cells that use up to 300 microns of silicon. With 10-micron thickness of silicon it is possible to reach a photo-current density of 42.5 mA/cm2 (from sunlight in the 300-1100 nanometer wavelength range), not far from the 100% solar absorption limit of 43.5 mA/cm2. By including solar absorption over the full 300-1200 nm range and using an optimized doping profile that minimizes Auger and surface recombination, it possible to reach as high as 30% power conversion efficiency using a thin and flexible 10-micron-thick sheet of silicon. In a 15-micron-thick silicon solar cell with interdigitated back contacts, it is possible to achieve even higher power conversion efficiency, well above the world record of 26.7% and close to the Shockley-Queisser thermodynamic limit of 33%. 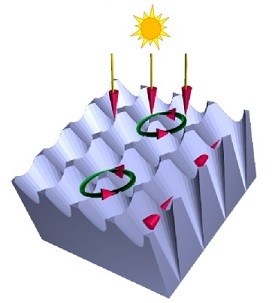 We have also shown near perfect solar absorption in ultra-thin-film Gallium Arsenide photonic crystals. With only 300 nm of GaAs, it is possible to absorb 99.5% of all available sunlight in the wavelength range of 300 nm- 860 nm. Using only 200 nm equivalent bulk thickness of GaAs, it is possible to realize a world record power conversion efficiency of 30% for a single-junction solar cell. We are considering ways to improve the efficiency of Perovskite Solar Cells using light-trapping effects. There are important consequences of photon localization and photonic band gap materials in the context of quantum electrodynamics [see for instance Physical Review Letters 64, 2418 (1990)]. These novel consequences are related to the fact that when an atom or molecule with a resonant optical transition of frequency coincident with the photonic band gap is placed inside a PBG material, spontaneous emission of light from the atom is inhibited. Instead, light remains localized in the vicinity of the atom in the form of a photon-atom bound state. Some consequences include zero-threshold laser activity [Phys. Rev. Lett. 74, 3419 (1995)], low threshold nonlinear optical response [Phys. Rev. Lett. 76, 2484 (1996)], all-optical transistor action [Phys. Rev. Lett. 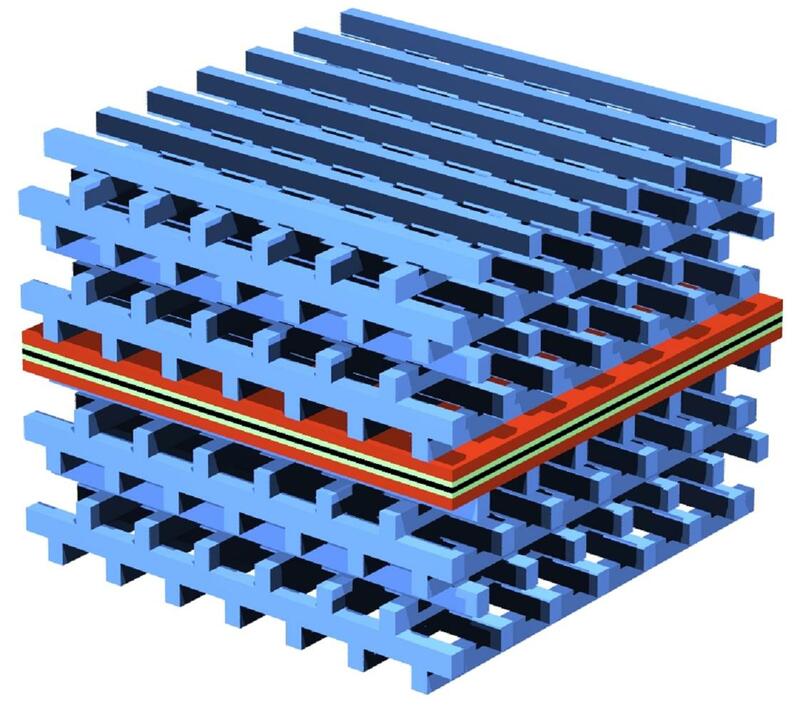 78, 1888 (1997)], and single-atom optical memory [Phys. Rev. Lett. 79, 5238 (1997)]. A very striking discovery [Physical Review Letters 103, 233601 (2009)] is that nearly complete coherent control of the excitation dynamics of quantum dots by picosecond optical pulses in a photonic band gap waveguide. In particular it is possible to achieve and maintain complete inversion of quantum dots with femto-joule optical pulses. This provides a basis for a multi-wavelength-channel, all-optical-transistor in a photonic band gap microchip that can perform optical logic and optical information processing. We have demonstrated that charge carrier (electron-hole) dynamics in a semiconductor quantum well can be significantly modified by the electromagnetic environment of a Photonic Band Gap [Physical Review Letters 99, 046801 (2007)]. Unlike the situation in a simpler one-dimensional optical cavity, bound electron-hole pairs (excitons) in a 3-D Photonic Crystal can have very long lifetimes with respect to radiative recombination, allowing time for thermodynamic equilibrium to be established. The effective mass of the exciton can be reduced by four orders of magnitude through dressing by photonic band edge photons and the energy range over which this effect persists can exceed the room-temperature-scale This may lead to novel quantum effects such as Bose-Einstein condensation at room temperature and new types of exciton-polariton lasers [Nature Scientific Reports 4, 7432 (2015)Nature Scientific Reports 4, 7432 (2015)]. Lab-on-a-chip (LoC) optical bio-sensors are promising paradigms for portable, convenient, and inexpensive medical testing. They enable diagnosing diseases at early stages at home without requiring expensive, time-consuming, external laboratory testing. Our paper, Optical Bio-sensing of Multiple Disease Markers in a Photonic-Band-Gap Lab-on-a-Chip: A Conceptual Paradigm [Phys. Rev. Applied 3, 034001 (2015)] describes the application of photonic crystals to this subject. Unlike previous optical bio-sensors that are based on the shift of a sharp optical resonance in response to the binding of a disease-identifying-protein to an optical micro-cavity, we propose a new paradigm for a medical lab-on-a-chip. This involves a photonic band gap micro-chip with micro-fluidic channels embedded in a glass slide that can provide a much more detailed spectral fingerprint of various diseases or various stages of a given disease using the cascaded transmission of laser light through the chip. It allows, for the first time, the instantaneous identification and differentiation of multiple disease markers in a single diagnostic sample, using transmission of light through a centimeter scale slide. A remarkable property of Photonic Band Gap waveguides is that they can confine light in the low-refractive-index region (e.g., water in our biosensor). This is especially beneficial for biosensing since the analytes usually reside in the low-refractive-index region. This facilitates simultaneous realization of high sensitivity and low limit of detection, a pair of conflicting figures of merit for conventional optical sensors. A new spectroscopic technique for turbid media is known as Diffusing Wave Spectroscopy. This enables measurement of structural and temporal properties of an opaque medium in which light undergoes a multiple scattering path. An application of this method is in diagnostic medical imaging [Journal of Biomedical Optics 1 (2), 180 (1996)]. Using multiple scattering of near-infrared light, it is possible to image brain and breast tumors non-invasively and inexpensively. Unlike X-rays that use very short wavelength radiation and magnetic resonance imaging that uses very long wavelength radiation, near IR light is an intermediate frequency probe which is sensitive to metabolic processes such as the local oxygenation level of hemoglobin. Unlike earlier methods based on the diffusion theory of light in tissue that provides resolution on the scale of a millimeter, Diffusing Wave Spectroscopy offers the possibility of resolution on the scale of 10 microns. Rather than tracking only the intensity fluctuations of diffusing light due to an inhomogeneity within a turbid medium, this new technique tracks changes in the optical Wigner Coherence function. This holds the possibility of early detection of tumors during the early metabolic stages of formation before structural damage takes place. Related to the theory of multiple light scattering in disordered media is the phenomenon of random lasing. Our theoretical models describe (i) how this effect occurs in a photon diffusion model [Physical Review A 54, 3642 (1996) Theory of Lasing in a Multiple Scattering Medium] and (ii) the long-sought-after quantum statistical properties of light emission from the random laser [Physical Review E 69, 046603 (2004) Theory of Photon Statistics and Optical Coherence in a Multiple-Scattering Random Laser Medium]. The microscopic mechanism for high temperature superconductivity is still an unsolved problem in theoretical physics. We have suggested the concept of spin-flux as a possible microscopic starting point for a first principles theory of non-Fermi liquid behavior in the normal state of these superconductors. This proposal suggests that a fundamental Law of Nature remains to be fully recognized before a clear microscopic understanding of high Tc superconductivity is possible. This Law of Nature is the existence of a new quantum number in a correlated electron system that manifests itself when an electron undergoes a somersault in its internal coordinate system as it traverses a closed loop in external coordinate space. This classical somersault trajectory can be described in terms of a "flux" that couples directly to the spin of the electron rather than its charge. This leads to the appearance of quantized spin-flux, a new degree of freedom in a many-electron system. In our many-electron state exhibiting spin-flux, charge carriers added to the antiferromagnetic normal state are naturally clothed by vortex textures in the antiferromagnetic background. We have shown that these charged solitons are bosonic collective modes and can explain non-Fermi liquid behavior and d-wave charge carrier pairing in a purely repulsive, interacting electron system. Remarkable agreement is found between this theory and numerous independently observed electronic, magnetic, and optical properties of the high temperature superconductors. For a brief review see [A Microscopic Model for D-Wave Charge Carrier Pairing in High Tc Superconductors: What Happens when Electrons Somersault?]. Further quantitative comparison with detailed experimental measurement of the magnetic structure factor is found in [Physical Review B 69, 224515 (2004) Incommensurate magnetic neutron scattering in cuprate high Tc superconductors: Evidence for charged meron-vortices]. Photon Localization and Photonic Band Gap Materials. ''Localization of Light'', S. John, Physics Today, May (1991), Cover Story.